The old image of the "Onsen" as a place where the elderly gathered to gossip and relax is being overtaken with the new image of the bath-house as an attractive social spot for people of all ages and from all walks of life. While the Seto Inland Sea area can't boast a plethora of Onsens, it does house one of the oldest in Japan - Dogo Onsen in Matsuyama, the setting for 'Bocchan' , a famous novel by Soseki Natsume, and Kinoe Onsen on Osakikamijima where you can enjoy a wonderful view of Seto Inland Sea. The old onsens where a lot of locals go give you an opportunity to experience some local atmosphere. The rules and culture regarding onsens are fairly strict: everybody is supposed to be naked in onsens and most onsens have separate rooms for men and women. Having said that, some hotels and ryokans have private baths/onsen in the rooms and some have "family baths" that can be reserved for private use. DO NOT wear a bathing costume! 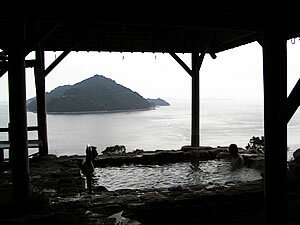 If you simply want to enjoy only onsen itself, you either bring your own towels or buy / rent one. You can put your valuables in your locker or you can also deposit your baggage at the front desk. The protocol when you enter the onsen is very important - wash yourself in the shower before you go into the communal bath, don't put your towel in the bath water, and enjoy!! !